Field trip is our school special activity. All the students enrolled in our school will travel together every 6 months to the most interesting destinations in Japan. They have the chance study some history, traditional practices and also see beautiful landscapes. In this outdoor activity students will experience and discover many aspects of life and society in Japan. They will experience how to prevent earthquakes, learn going to factories, investigate in department stores, post offices, etc. using the Japanese Language to communicate. 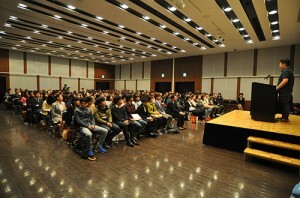 Students have 2 chances every year to show their Japanese ability in class and in front of the whole school members. This is a great opportunity to understand students’ thinking and also an opportunity for the students themselves to prove their effort in each level. Team work is very important when studying, working and living in society. Project work is the activity which let students discuss, discover, share, cooperate and work together in a topic and then present it to all students and teachers. Orientation for living in Japan, traffic rules orientation (in cooperation with police staff) are specially held for new students to help them to have a safe and comfortable life while studying and living in Japan. 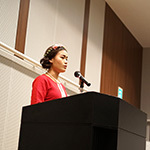 University and Vocational school Guidance is the event organized by I.C.NAGOYA with universities and vocational schools around Nagoya city and surrounding prefectures. 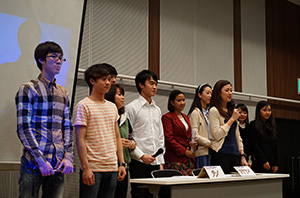 Students can get direct information from their future schools with the support of I.C.NAGOYA teachers in the application process.